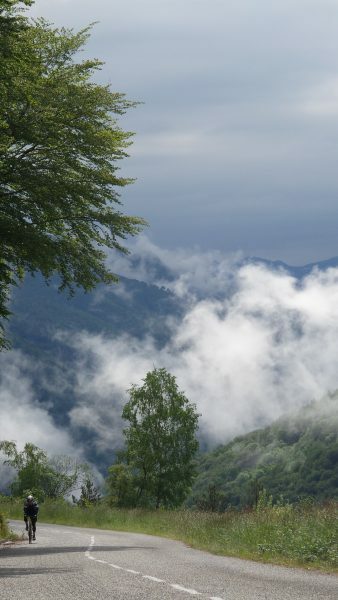 One of our loyal clients David Crighton joined us on one of our Classic Cols of the Pyrenees holidays and proceeded to write a fantastic post-mortem of each day’s Challenge route. 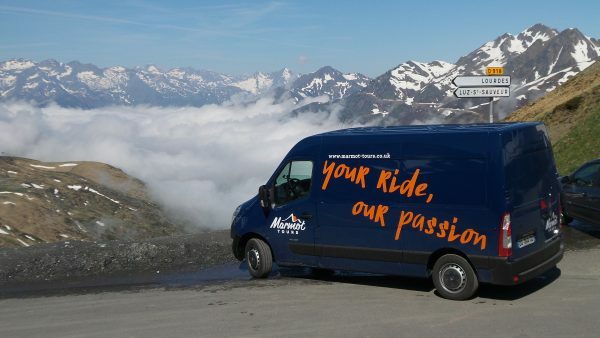 Our Classic Cols style holidays really are perfect for mixed ability groups as they give you the flexibility each and every day to decide how much (or little) to challenge yourself. The daily Classic route warms you up gently as the week progresses, so that you’re ready for your ascent of the Tourmalet on Day 6. If you’re wanting to push yourself a little further, you have the option of upping the ante with the Challenge route, with ‘optional extras’ each day pushing up the daily ascent to over 3000m. Again, you get to decide which to ride on a day by day basis – after all it’s your holiday, your ride. Top tip – Go easy, pace yourself and you will do it! Day 1 – 77km, 2111m. Col du Chioula -18.5km, 829m, 4.5% average, 1431m summit. A dawdle. Very pleasant wee climb. Col de Pailheres -18.9km, 1285m, 6.8% average, 2001m summit. Possibly a good climb spoiled by bad weather (Ed: that day!). Descent was in a deluge on rough surfaces. Day 2 – 128km, 2980m. Plateau de Beille – 15.9km, 1246m, 7.8% average, 1788m summit. Good long climb and descent probably ruined by mist and low cloud. Col de Port – 17.5km, 777m, 4.4% average, 1249m summit. Good climb but harder than the stats suggest. Col d’Agnes -10.6km, 926m, 5.3% average, 1570m summit. Long climb through a stunning valley with some steep sections to follow. Day 3 – 122km, 3050m. Col de La Core – 14.25km, 885m, 5.1% average, 1395m summit. Feels harder than the stats suggest. Good climb with stunning views at the summit and a great descent. Col de Porte D’Aspet – 18.1km, 549m, 3.1% average, 1069m summit. Lumpy ride in and hard to keep a rhythm. Steep at the end. Nothing of note at the summit. ‘Cafe legs’ if you stop at the restaurant in Porte D’Aspet. Great descent but watch the hairpins. 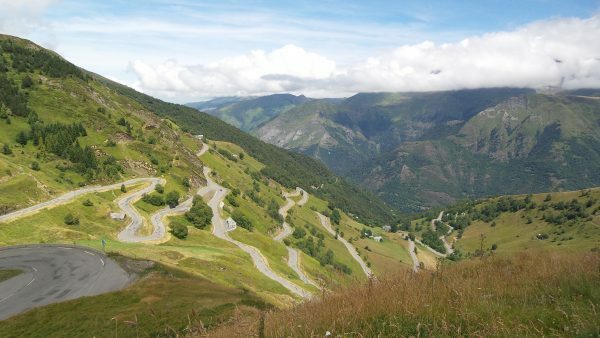 Col de Mente – 11.1km, 750m, 8.7% average, 1349m summit. Changes in rhythm make it hard. Long section of hairpins to the top. HOT! Nice long climb with some views and a beautiful surface. Brilliant descent. Nice waterfalls near the bottom. Day 4 – 108km, 2500m. Port de Bales – 20.2km, 1185m, 6.2% average, 1755m summit. Starts easy and hardens. Respites after long steep sections. Good. Superbagneres -19.3km, 1119m, 6.8% average, Suffering more than worthwhile. A real grind followed by superb views and a fast descent. Very fast. Col du Peyresourde -13.9km, 946m, 6.8% average, 1569m summit. A sting in the tail but not overly challenging. 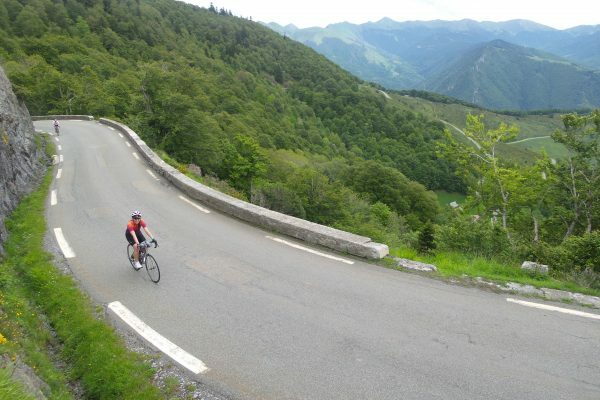 Col D’Azet – 8km, 616m, 7.3% average, 1580m summit. Starts steep and eases to “only” 8%. Lovely wee climb. Watch out for the drain on the descent just as you enter Azet. Pla d’Adet – 11.2km, 875m, 7.8% average, 1680m summit. Splendiferous panoramic view from the top (if you make it). I made it and the views were spoiled by low cloud. A slog. Could be a great descent but the surface is rough. Col du Aspin -12.1km, 792m, 6.5% average, 1489m summit. Beware the gradient toughens at 8km. Lovely climb possibly spoiled by low cloud and mist. Superb descent and a brilliant run down to Bagneres. Day 6 – 125km, 3670m. Col Du Tourmalet – 29.1km, 1560m, 5.4% average, 2115m summit. Steepest at La Mongie. Not as hard as expected but helped by cool weather. Luz Ardiden – 15.3km, 1008m, 7.7% average, 1718m summit. Lovely climb full of corners. A personal favourite with wonderful views. Hautacam – 16.3km, 1192m, 7.5% average, 1616m summit. Much harder than expected, probably due to accumulation of climbs. I stopped at the official finish and now wonder what it would have been to go to the summit. All completed with the wonderful support from Helen and Sam. Supplies in the van meant I only used 2 gels on the entire trip. Enjoy! 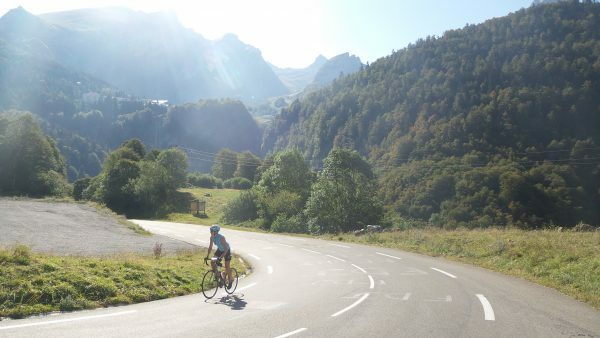 Our huge thanks go to David for such a great write-up – we hope it’s inspired you to give our Classic Cols of the Pyrenees road cycling holiday a go! For information on the full itinerary of the trip, check out our Trip Notes and if all that’s tempted you, you can always drop us a line if you’d like to check availability….